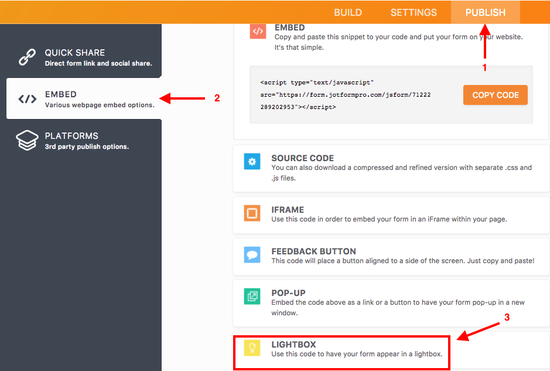 This guide will show you how to use session cookies to automatically open a JotForm lightbox when a user first visits your web page. You will need access to a PHP enabled Webserver to host your web page to be able to create this effect. (b) after clicking Embed tab, select the LightBox option. 3. We need to make a small change to this code to enable us to open our lightbox automatically; just change the openOnLoad function, it's after the width set, it should look like this openOnLoad:true . 4. Ok, now we are ready to transfer this code to your web page. Create a PHP file on your Webserver (as we are using PHP code to create this effect, your will page will use the .php extension.) Mine is called sessioncookie.php. 5. In this page, we begin by adding some PHP that will check for a session cookie if it doesn't exist it creates one and sets a variable that we will use later to know if we need to open our Lightbox form. If it already exists nothing is done (i.e no lightbox form will be displayed). NOTE: When the browser window is closed, this cookie gets 'destroyed'. NOTE: If you looking to create this effect on your own web page with your own form, you need to change lightbox embed code (highlighted in blue text) to that of your own. This code, using the variable mentioned earlier, adds the Lightbox code to our web page (and launches it) if no cookie was found. This code is also available here if you wish to copy and paste sections of it. You can view and test the functionality of my example web page with the effect in place here. Questions? Please post it to our support forum or put it as a comment below! Is it possible to do this with my website, which was created using Weebly? If so, could you please provide instructions as to how to do it? 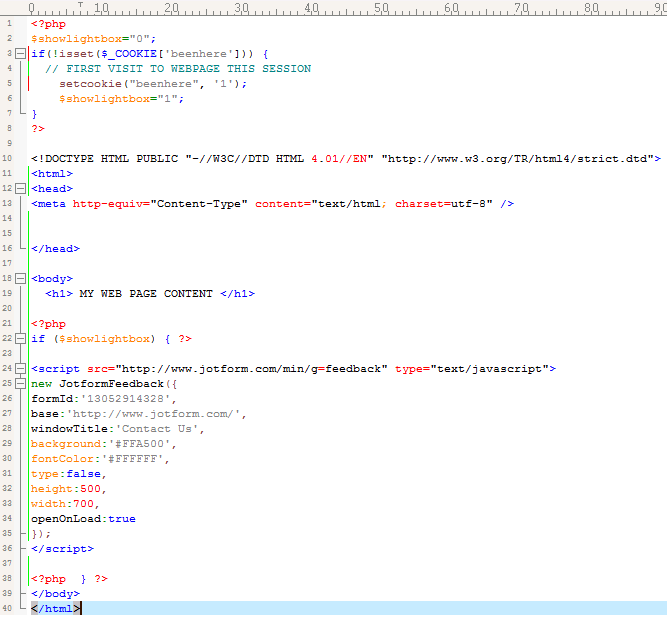 Kindly let me know how can i use this to open a particular page of my site. I need same code to open my signup page once a day. What if you dont want the cookie to be destroyed in the code above... What do I need to change? and the lightbulb code works fine in Chrome but not in Internet explorer what could possibly be the problem? Is there a solution for this that does not use php? nice guide thanks. what if the page we'll put the code is an asp page?